If you're not yet familiar with the Led Zep-rivalling supergroup, you'll probably recognise Michael Anthony as a founding member of Van Halen. Anthony joined the band as bassist in 1974, before being replaced by Eddie Van Halen's son - Wolfgang - in 2004. As well as a series of Yamaha bass guitars, Anthony boasts his own custom-made Jack Daniel's model. Shaped like a whiskey bottle, of course. Check out this video to see it in action. 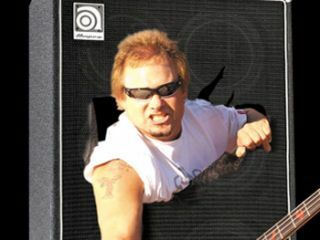 So, for the full-house, we're talking to Michael Anthony this week and giving you the chance to ask the questions. Simply add one to the comments below (you'll have to be registered and logged in to do so). We'll pick the best and ask them during the interview.